New parent jitters? No problem. Use a baby monitor to keep tabs on your little one when he's not in the same room. Every baby monitor has two pieces -- a base which is placed in your child's room and a receiver that's kept wherever you are. That said there are several types of monitors available on the market. Wondering which one will work best with your lifestyle? Answering these questions should help. Do you want to be able to see your baby? Then invest in a video or a wireless network monitor -- they give you picture and sound. Some models even allow you to pan, zoom or view your little one with night vision. Bases and receivers come in varying shapes and sizes. If you plan on mounting the monitor on the wall or placing it on a dresser or nightstand, make sure you know how much space you have before you set your heart on a specific style. Do you want to walk from room to room without bringing the receiver? Get a monitor that comes with more than one receiver. Set one up in your bedroom and place the second monitor in the kitchen or living room. There are even receivers that communicate with each other like Walkie Talkies -- so you can ask your husband to get the baby without having to yell upstairs. What frequency is your cordless phone and wi-fi? Monitors come in a few different frequencies. Purchase a monitor with the same frequency as your cordless phone or wi-fi and you could end up suffering from interference.Do you want a plug-in or battery operated monitor? Most monitors come with both. Typically the base has batteries that are non-rechargeable and the receiver has batteries that are. If you plan on using the batteries more often than the plug, make sure you purchase a monitor that doesn't burn through them quickly. Invest in a monitor with multiple transmitters. Put one in each child's room and keep tabs on all of them at the same time. Beware that the transmitters may interfere with each other's signals. Do you want to be able to view your child when you're not at home? Pick a wireless network monitor that you can access via Skype on your smartphone, tablet or laptop. Now that you've figured out what you're looking for in a monitor, which style are you going to purchase? The following breakdown gives you all the details to help narrow down your final choice. Transmits via your existing wireless network so you can use your computer as a receiver. Both. Yes, as long as your receiver is a laptop, tablet or smart phone. Temperature sensor, intercom, multiple channels, pan, zoom, night vision, records video. 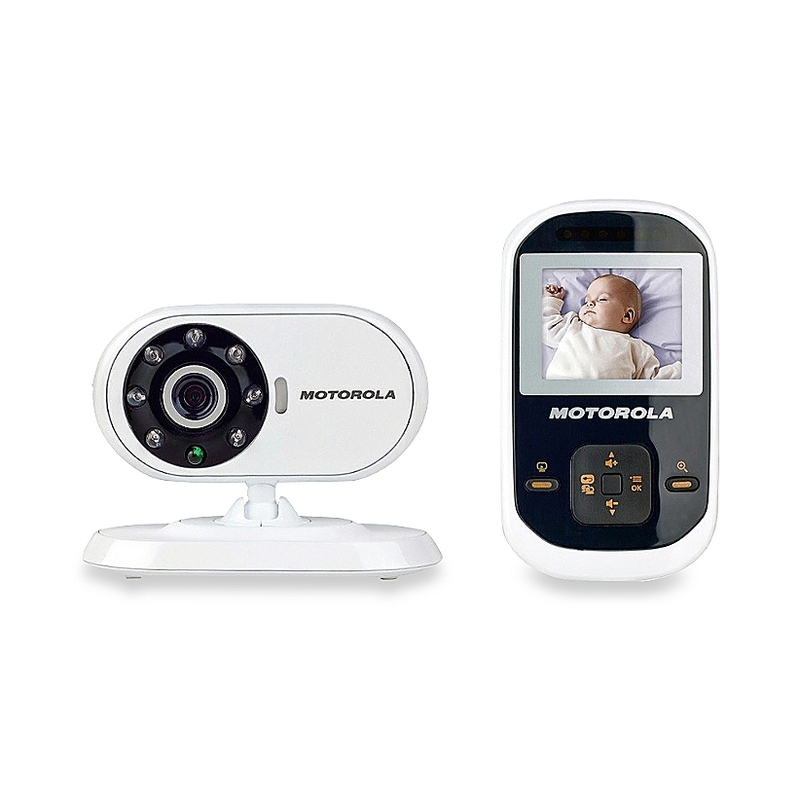 A small video camera in your child's room transmits to a handheld receiver. Both. Yes. Temperature sensor, intercom, multi-room, low-battery signal, pan, zoom, night vision, multiple channels, out-of-range signal. Uses radio frequency to transmit sound from the baby's room to the receiver. Audio only. Yes Sound light, temperature sensor, intercom, multi-room, low-battery signal, out-of-range signal, multiple channels. Uses a battery operated sensor pad. Neither. An alarm sounds on the receiver if there is no movement sensed after 20 seconds. Can be used in conjunction with a sound monitor. Yes. Temperature sensor, out-of-range signal, low-battery signal, multiple channels. How does a sound light work? Why is it important to get a monitor with multiple channels? This list of common extras gives you the answers to these and other common baby monitor questions.Multiple channels: Switch channels to find a better frequency. The more channels the better! Sound light: The monitor lights up when your baby makes noise. Low battery signal: It lets you know when the batteries need to be changed. Intercom: This extra lets you soothe a fussy little one with the sweet sound of your voice from another room. Out-of-range signal: Lets you know when the receiver is out of range from the transmitter. Multi-room monitor: This feature lets you scan back and forth between two rooms. Some audio models color code the light up display for each room so you can tell them apart. Temperature sensor: Monitors the temperature in your baby's room. Ideally, it should be 68 to 72 degrees. Belt clip: Hook the receiver to your belt so you don't have to carry it in your hand. Infrared night vision: See what your little one is doing even in complete darkness. Adjustable camera: Zoom and pan to get a better view of your baby. Your baby monitor is an electrical appliance, never use it near water. Keep all parts of the monitor (transmitter, receiver and cords) out of reach from your children. Make sure your batteries are charged. You don't want your monitor to die in the middle of the night. Never place a monitor with a cord within 3 feet of a crib or within baby's reach. This will help reduce the risk that your child will obtain access to the cord which can pose a strangulation hazard.